Wednesday, January 5, 2011 — For nearly a quarter of a century R. Lee Ermey has been the unannointed poet laureate of the vernacular branch of America’s military language. (The bureaucratic branch, appropriately, has no face). Breathtakingly obscene, surrealistically violent, and apparently inexhaustible, Ermey’s portrayal of Gunnery Sergeant Hartman, in Full Metal Jacket, threw moviegoers unaquainted with military manners right back in their seats. 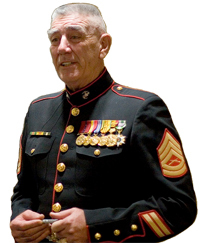 For those with military experience, particularly of the period being portrayed, Ermey’s performance carried an additional levels of richness and meaning. The role of drill instructor in the U.S. military may always have held an element of self-parody. In Ermey’s performance, self-parody was a schizophrenically equal partner. Wisely and uncharacteristically, the director allowed the actor to improvise a large part of his performance — Ermey clearly has a remarkable ability to spontaneously channel his reptile brain. Kubrick must have seen that as a perfect vehicle for delivering war itself to a theater audience. The performance made Ermey and his character one in the mind of the public. The element of self-parody is what gave Gunny’s character its lasting appeal, powerful enough to generate a sense of perverse nostalgia even among some who served involuntarily back during the bloody day. That element was missing in Ermey’s recent rant about Obama and socialism, which may be one reason it drew such a negative reaction. He has apparently been chastened by that reaction, and has issued an apology. The Editor, for one, hopes that this lays the matter to rest. The world without a benevolently-psychotic, endlessly-inventive, self-parodying and ultimately harmless reminder of our own ridiculousness is a sadder, lesser place. Posted: January 5th, 2011 under For the Record, Uncategorized.